Accurate and refined drawings are vital to a successful excavation. It is way too much work to try to dig foundation trenches manually - you need a machine. A mechanical digger is a big tractor like machine with a big digger arm on the back or front. Sometimes they have big rubber wheels and sometimes they have tracks. They go by various names such as backhoe, trackhoe, excavator, or JCB. You can use a friendly generic name such as "digger", but I tend to say excavator. They are way too expensive to buy your own for building your house, so you will need to rent one, and it will probably come with an experienced operator. They are not cheap to rent, so you need to avoid it sitting idle for more than a few minutes. That means you need to be super prepared ahead of it arriving on site. Here is a picture of the one I used on the evaluation building. For the main house I needed a full sized excavator because I was dealing with very hard rocky ground and a much bigger area. You will have done detailed drawings of your house floor plan and your foundation design, but these drawings have lots of unnecessary information that does not pertain to the marking-out and the digging you need done. Ahead of the excavator arriving, you need to produce a couple of drawings that just describes the specific digging that is needed. You will need to transfer these drawings to the real ground using wooden stakes and spray paint so the excavator knows where to dig and how deep. You will need a nice simple "Excavation Plan" and a simple "Excavation Cross Section" so it is easy to explain to the excavator operator what's needed. 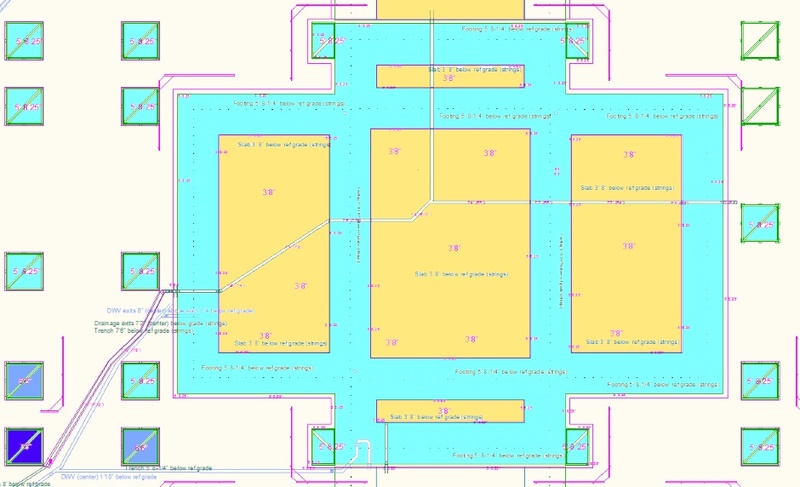 Do the excavation drawings accurately in your CAD package. Add a layer that shows where the excavation cuts should be and then turn off all the other layers. Take a JPEG of the drawing. Make sure that your excavation drawing reflects the fact that the excavation goes further out than the Form-a-drain strings (to allow for the drainage pipe and rock). The drawing below correctly allows for this. From outside of wall concrete to the outside of the outer Form-a-drain is 1'4". From outside of wall concrete to the outside of the inner Form-a-drain is 3'4". From outside of wall concrete to center of vertical rebar is 5-3/4" (both 8" and 12" cavity walls). From outside of wall concrete to the outside of the outer Form-a-drain is 2'0". From outside of wall concrete to the outside of the inner Form-a-drain is 2'8". From outside of wall concrete to center of vertical rebar is 4". Where there is a drainage pipe round the outside then add 6" of extra excavation width. Where there is not a pipe (eg on the inside) then just add 1" of extra excavation width. Note that the Form-a-drain strings on the batterboards are different for internal walls compared with external walls. That means there will sometimes be two outer strings and two inner strings on one batterboard. The offset difference is 8". During the excavation for the footings etc you are not interested in the position of the Form-a-drain. You will remove the Form-a-drain strings and just have strings that tell the excavator where to dig. You will not remove the screws that the Form-a-drain strings attach to so it will be easy to put them back later. You will add the excavation strings using the Form-a-drain screws as the reference for measuring. 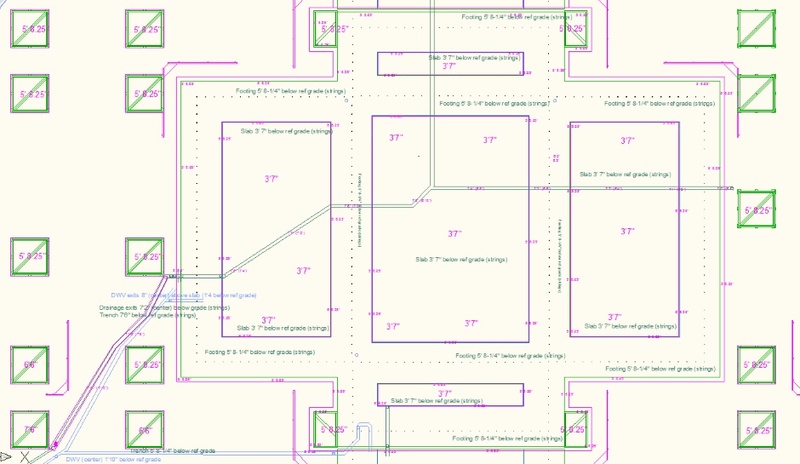 Your CAD drawn excavation plan will tell you where the excavation strings should go, but typically they are 6" further out than the outer Form-a-drain string position, and 4'9" inwards from the outer Form-a-drain string position. When measuring the excavation depths it is the height of the batterboard strings that is the reference that you measure down from. For more accuracy use a self leveling laser set at the batterboard height and measure down from that. The reality is that both the outer and inner strings will be in the way when the excavator starts digging. What's important is that the wood screws in the top of the batter boards stay in place. You can unhook the strings from the screws when necessary and when strings get broken you can implement new strings. To help the excavator operator you can use spray paint on the ground and/or temporary stakes, that you place by being guided by the strings before you unhook them. If the excavator operator is color blind then it is best to use white spray paint. Once in a while you can re-hook the strings to make sure the digging is proceeding well and re-implement temporary stakes as necessary. The painted lines are determined by the positions of the strings. They are visible to the excavator operator after the strings have been removed are the actual digging is happening. The paint gets erased as the excavator drives over the lines are excavates down so you need to keep re-attaching the strings and repainting the lines. The actual foundation digging (ie the footing trenches and the under-slab level) must not be done until the batter boards and batter board strings are accurately set in place or else the digging with the excavator will be inaccurate and you will have a lot of manual digging to do to finish off (and correct).